Imagine a prosthetic limb that can have a sense of feeling. Scientists at Johns Hopkins University have created e-skin or electronic skin. It's made of fabric and rubber-laced with sensors to mimic nerve endings. 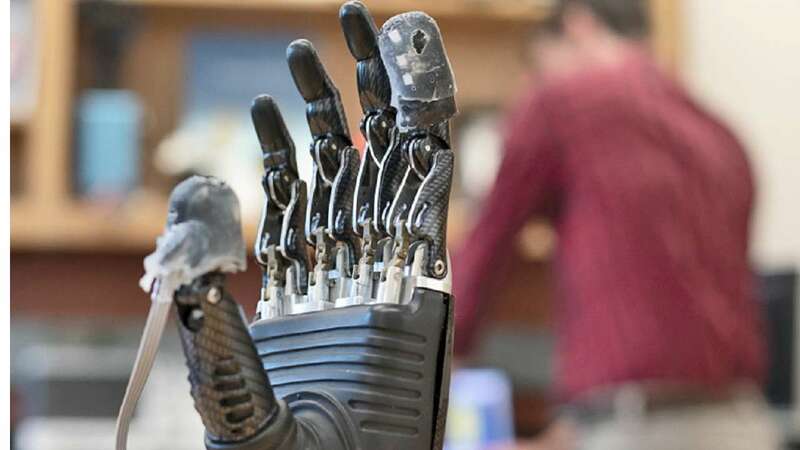 For the person using a prosthetic hand, e-dermis recreates a sense of touch. It also recreates a sense of pain by sensing stimuli and sending impulses back to the peripheral nerves. The pain function is very important because it protects the user from injury and the prosthetic limb from damage. Providing that important functionality of touch is a significant tech breakthrough. Human skin contains a complex network of receptors that relay a variety of sensations to the brain. The researchers used the network as a biological template for their work. They made a sensor that goes over the fingertips of a prosthetic hand and acts like the person's own skin would with receptors sensing touch and pain. The e-dermis conveys information to the amputee by stimulating peripheral nerves in the arm, making the prosthetic hand come alive. It provides the user a continuous sense of tactile perceptions from light to painful. Johns Hopkins scientists have demonstrated that it is possible to restore a range of touch-based feelings to amputees who use prosthetic limbs. The goal now is to service those who already have a prosthetic limb and fit e-skin over it. The e-skin will tell and let the wearer feel whether an object is pointed, sharp or safe. According to researchers, the e-skin could also be used to make robotic systems more human. And, they add, it also could be used to expand or extend to astronaut gloves and space units.